Cotton can refer to members of the genus Gossypium of flowering plants or to the fiber produced from some species of these plants. Since ancient times, some species of cotton plants have been cultivated by humans as a source of fiber for cloth and other uses. Today, cotton fibers are used to make clothing, bedsheets, towels, yarn, fishnets, tents, and innumerable other items, and the seed is used to produce cottonseed oil. Cotton has had a tremendous impact on human history. Although the use of cotton plants traces back thousands of years, it was the late eighteen century invention of the cotton gin—a machine that removed the cotton fiber from the seeds—that resulted in cotton becoming a major crop. With cotton becoming a major cash crop, human exploitation of other humans for personal benefit became an increasing problem. In the United States, slavery increased as slaves were imported to grow and harvest the crop. In India, tariffs and other restrictions imposed by the British government led to the cotton grown in India being processed in England. As a result, Indian laborers received very little money to pick the cotton, which would return to India from England as cloth and textiles marked up at very steep prices, with most of the profit going to the British labor market. Most cotton plants are shrubs. Most species require a warm climate and fertile soil to grow; they are killed by frost. The fruit of the cotton plant is called a "cotton boll." In it are the seeds, which are surrounded by cellulose fibers. When the boll ripens, it splits open and the fibers are exposed. The fiber's cellulose is arranged in a way that gives them a high degree of strength, durability, and absorbency. Each fiber is made up of twenty to thirty layers of cellulose coiled in a neat series of natural springs. When the boll is opened, the fibers dry into flat, twisted, ribbon-like shapes and become kinked together and interlocked. This interlocked form is ideal for spinning into a fine yarn or thread. 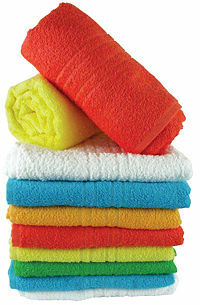 Cotton fibers are used to make a number of textile products. These include terrycloth, used to make highly absorbent bath towels and robes; denim, used to make blue jeans; chambray, popularly used in the manufacture of blue work shirts (from which we get the term "blue-collar"); along with corduroy; seersucker and cotton twill. Socks, underwear, and most T-shirts are made from cotton. Bed sheets are also often made from cotton. Cotton is also used to make yarn used in crochet and knitting. While many fabrics are made completely of cotton, some materials blend cotton with synthetic fibers such as polyester or rayon. In addition to the textile industry, cotton is used in fishnets, coffee filters, tents, and in bookbinding. The first Chinese paper was made of cotton fiber, as is the modern United States dollar bill and federal stationery. The cottonseed, which remains after the cotton is ginned (the fibers and seeds separated), is used to produce cottonseed oil. After refining, cottonseed oil can be consumed by humans like any other vegetable oil. The cottonseed meal that is left is generally fed to livestock. 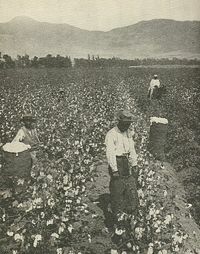 The cultivation of cotton began in several places independently. Gossypium barbadens was cultivated in South America about five thousand years ago, G. hirsutum in Mexico about the same time, G. arboreum in western Asia about four thousand years ago, and later G. herbaceum in Ethiopia or southern Arabia (Ikziko 2006). After harvesting, cotton fibers were separated from the seeds and spun into thread, most often on a spinning wheel. The threads then could be woven into cloth. A fragment of cotton cloth was found in the ancient Indian city of Mohenjo-daro, dating from around four thousand years ago (Wolpert 1991). Since the bolls had to be harvested and the fibers separated from the seeds by hand, cotton cloth was very expensive in ancient and medieval times. It was valued for its durability and because it is more comfortable to wear in hot weather. 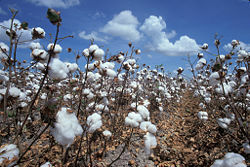 Cotton cultivation was widespread in both South and North America and in the Caribbean. The Aztec emperor was given bolts of cotton cloth as tribute from his provinces (Ikziko 2006). After 1492, South American cotton was introduced to Egypt, where it became known as "Egyptian cotton" and was possibly hybridized with African cotton, and also introduced to the coast lands and coastal islands of southeastern North America, where it was called "sea island cotton." Mexican cotton was also grown in the American Southeast, where it was known as "upland cotton," since it was grown inland away from the coast. By the end of the 1600s, cotton was cultivated throughout the warmer regions in Africa, Eurasia, and the Americas. Cotton remained a fairly minor crop until the invention of the cotton gin in 1793 by American inventor Eli Whitney. The cotton gin was a simple machine that removed the cotton fiber from the seeds so that part of the work no longer had to be done by hand. This led to a great reduction in the amount of labor and therefore the cost of producing cotton. About the same time new machines were being developed, especially in England, which likewise reduced the cost of spinning the fiber into thread and weaving it into cloth. This led to a tremendous increase in the amount of land used for cotton cultivation in the American South (Cooper 1991). In 1850, cotton accounted for just over half the value of all goods exported from the United States (Dodd 1920). From 1850 to 1860, the value of the American cotton crop doubled and was ten times the value of the tobacco crop, which had been the main cash crop of the South in the century before (Dodd 1920). Since most of the cotton was grown and harvested by slave labor, the increase in the production of cotton meant that slavery expanded and became a much more important factor in American society. In 1784, when the first bale of American cotton was shipped to England, there were half a million slaves in the United States. In 1861, the start of the American Civil War, there were almost four million slaves (Hobhouse 1985). The American Civil War, which was caused mainly by the conflict between northern and southern states over the issue of slavery, disrupted cotton cultivation and cut off its export to the mills in the northern states, France, and England. During the war, British and French traders invested heavily in Egyptian cotton plantations and the Egyptian government of Viceroy Isma'il took out substantial loans from European banks and stock exchanges. After the war ended in 1865, British and French traders abandoned Egyptian cotton in favor of cheap imports from the United States, sending Egypt into a deficit spiral that led to the country declaring bankruptcy in 1876. 1. You English buy Indian cotton in the field, picked by Indian labor at seven cents a day, through an optional monopoly. 2. This cotton is shipped on British bottoms, a three weeks journey across the Indian Ocean, down the Red Sea, across the Mediterranean, through Gibraltar, across the Bay of Biscay and the Atlantic Ocean to London. One hundred per cent profit on this freight is regarded as small. 3. The cotton is turned into cloth in Lancashire. You pay shilling wages instead of Indian pennies to your workers. The English worker not only has the advantage of better wages, but the steel companies of England get the profit of building the factories and machines. Wages; profits; all these are spent in England. 4. The finished product is sent back to India at European shipping rates, once again on British ships. The captains, officers, sailors of these ships, whose wages must be paid, are English. The only Indians who profit are a few lascars who do the dirty work on the boats for a few cents a day. 5 The cloth is finally sold back to the kings and landlords of India who got the money to buy this expensive cloth out of the poor peasants of India who worked at seven cents a day. By 1900, cotton amounted to 75 percent of the world's commercial textile fiber production (Iziko 2006). It is now about 40 percent because of the development of synthetic (manmade) fibers. Today cotton is produced in many parts of the world. In 2006, the largest growers were in order of production: China, India, the United States, Pakistan, Uzbekistan, Brazil, and Turkey (USDA 2006). The cotton industry relies heavily on chemicals, such as fertilizers and insecticides, although a very small number of farmers are moving towards an organic model of production, and organic cotton products are now available for purchase at limited locations. 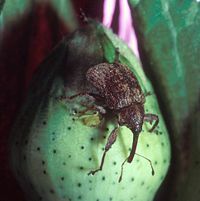 Historically, in North America, one of the most economically destructive pests in cotton production has been the boll weevil. Due to the United States Department of Agriculture's highly successful Boll Weevil Eradication Program (BWEP), this pest has been eliminated from cotton in most of the United States. This program, along with the introduction of genetically engineered cotton containing a gene that codes for a plant-produced protein that is toxic to a number of pests, such as tobacco budworm, cotton bollworm and pink bollworm, has allowed a reduction in the use of synthetic insecticides. 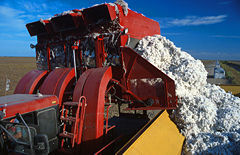 Most cotton in the United States, Europe, and Australia is harvested mechanically, either by a cotton picker—a machine that removes the cotton from the boll without damaging the cotton plant—or by a cotton stripper, which strips the entire boll off the plant. Cotton strippers are generally used in regions where it is too windy to grow picker varieties of cotton and generally used after application of a defoliant or natural defoliation occurring after a freeze. Cotton is a perennial crop in the tropics and without defoliation or freezing, the plant will continue to grow. The logistics of cotton harvesting and processing have been improved by the development of the cotton module builder, a machine that compresses harvested cotton into a large block, which is then covered with a tarp and temporarily stored at the edge of the field. Genetically modified (GM) cotton was developed to reduce the heavy reliance on pesticides. GM cotton is widely used throughout the world, with claims of requiring up to 80 percent less pesticide than ordinary cotton. The International Service for the Acquisition of Agri-Biotech Applications (ISAAA) said that worldwide GM cotton was planted on an area of 67,000 square kilometers (16,500,000 acres) in 2002. This is 20 percent of the worldwide total area planted in cotton. The U.S. cotton crop was 73 percent GM in 2003. Organic cotton is cotton grown without pesticides or chemical additives to fertilizer, relying instead on methods with less ecological impact. Organic cotton is used to manufacture everything from handkerchiefs to kimono robes. Different levels of certification exist, but at a minimum, a crop must be grown in soil that has been chemical-free for at least three years. Cotton is an enormously important commodity throughout the world. However, many farmers in developing countries receive a low price for their produce, or find it difficult to compete with developed countries. This has led to 'fair trade' cotton clothing or footwear being available in some countries. The fair trade system was initiated in 2005 with producers from Cameroon, Mali, and Senegal. ↑ United Nations Conference on Trade and Development, Infocomm: Market Information in the Commodities Area: Cotton Market. Retrieved August 20, 2007. Dodd, W. v. E. 1920. The Cotton Kingdom: A Chronicle of the Old South. New Haven, CT: Yale University Press. Duke, J. 1983. Gossypium hirsutum L. Purdue University. Retrieved August 20, 2007. Fisher, F. B. 1932. That Strange Little Brown Man Gandhi. New York: Ray Long & Richard Smith, Inc.
Iziko Museums of Cape Town. 2006. Gossypium (Cotton). Retrieved August 20, 2007. United States Department of Agriculture (USDA). 2006. USDA Foreign Agricultural Service: Cotton World Markets and Trade. Retrieved August 20, 2007. This page was last modified on 7 July 2016, at 16:09.